What’s the perfect dessert for a cold winter’s night? How about a rich and creamy Tiramisu? Nothing beats this delicious liquor dessert and if you serve it to your friends they are bound to find it irresistible! It'll definitely have them coming back for more! This tasty dessert serves four people but you can always double the ingredients if you want to make a bigger Tiramisu, say for a dinner or to serve at Christmas to all the family. It’s really easy to make and absolutely delicious. You can serve it with double cream if you want an extra treat but then some people find this dessert rich enough without the additional cream. 5 tablespoons of icing sugar and 30g of cocoa powder. Now let's get cooking! To begin with mix the coffee with the sherry and brandy in a bowl. Stir well so all those lovely flavours blend together. Next take a fancy bowl to serve your tiramisu in. Remember presentation is key, you want you tiramisu to look as impressive as it tastes. Place half of the trifle sponges in the dish and pour half of the coffee, brandy and sherry mixture over the sponges. Now you’ll need a mixing bowl. Pour in the cream and whisk gently. Add the cheese and the sugar and whisk some more. You want it all to combine and become smooth and lump free. When you’ve achieved this pour half of this mixture over the sponges and coffee mixture. Now you need to take the rest of the sponges that you set aside. Layer these over the sponge, coffee mix and cream. Pour the rest of the coffee over this layer of sponge and then cover with the last of the cream and cheese mixture. Using the back of a spoon smooth the top of the cream so it is nice and flat. Now take the cocoa powder and shake over the top of the tiramisu. Once again remember presentation is key so try make it nice and neat. If you want to go that extra mile you could place some chocolate buttons over the top to give it that extra sweetness. Or for a fruity treat chop some strawberries and add these to the top of the tiramisu in a pretty pattern. Once you are finished put the tiramisu in the fridge to chill. For best results make the tiramisu in the morning and chill it in the fridge until dinner time. When you come to serve it use glass trifle dishes for a special touch. 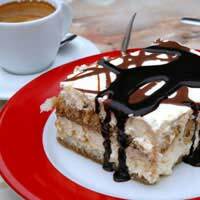 This tiramisu is delicious but also very rich so a small serving is fine! The best thing about it though is it is completely gluten free so you can serve it to all your guests whether they have a gluten allergy or not! How Will I Know if I Have a Gluten Allergy? What is a Gluten Allergy? What is Gluten Found In? Will Gluten Always be Listed as an Ingredient? Am I More Likely to be Intolerant to Other Foods? Are There Gluten Free Substitutes? Can I Have a Normal Day to Day Life with a Gluten Allergy? What Happens if I Eat Gluten Products? Why Avoid Wheat If You're Not Gluten Intolerant? Will having a Gluten Allergy Affect my Diet Considerably? How Should I Prepare for a Gluten Test? What Tests Check for Gluten Allergy? Where Can I Have a Gluten Test Done? Are Gluten Allergies Life Threatening? Are You Born With Gluten Intolerance? Can Gluten Allergies Be Developed Later in Life? Celiac or Crohn's: What is the Difference? Quiz: is Your Child Gluten Intolerant? What are the Minor Symptoms of Gluten Intolerance? What are the Severe Symptoms of Gluten Intolerance? What Effects Can a Gluten Allergy Have? Can an Untreated Gluten Allergy Cause Lasting Damage? Can Gluten Allergies be Treated with Medication? Can Gluten Intolerance be Cured? Does Gluten Intolerance Ever Go Away on its Own? Should I Avoid Alcohol with a Gluten Allergy? Should I See my Doctor if I Suspect I Have a Gluten Allergy? Will People be Able to Tell if I Have a Gluten Allergy?